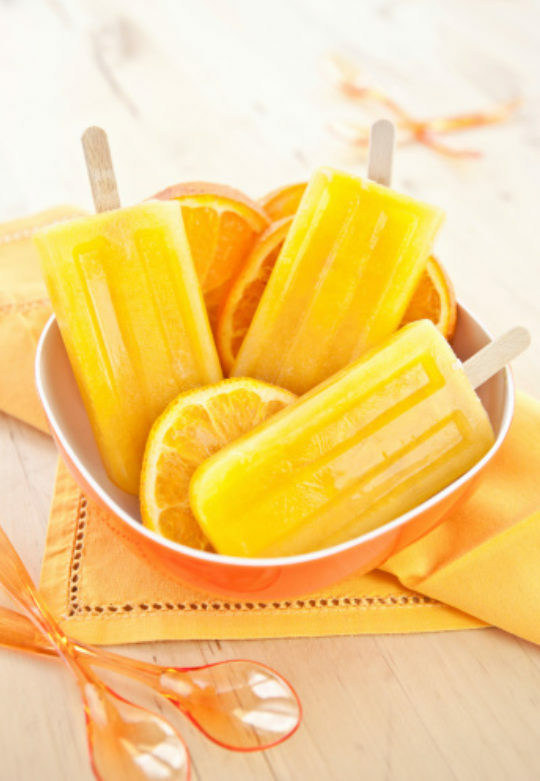 Actually little more than a frozen puree of tropical fruit, these pops never fail to satisfy a sweet tooth and quench your thirst. Put the fruit purees in separate bowls. To each bowl, add ¾ cup water, 1 tablespoon sugar and 1 tablespoon lime juice. Mix well. Divide each puree among 4 molds, muffin cups or paper cups. You can steady the paper cups by setting them in a small, square metal pan. If using molds, set the lids in place and insert the sticks in the slots. Freeze until firm, at least 3 hours. If using muffin tin or paper cups, partially freeze for about 1 hour before setting the sticks in the center of each cup. Unmold and let soften at room temperature for 3 to 4 minutes before enjoying. Makes twelve 2-ounce pops (12 servings). Baker’s Tip: Although several kinds of molds are available, the pops can also be made in muffin tins or 3-ounce paper cups. Simply remove the paper cups (you can peel them off) or molds just before serving.